Kyrgyzstan is situated in Central Asia, its neighboring countries are Kazakhstan to the north, Uzbekistan to the west, Tadjikistan to the south and China to its East and South-East. The former Republic of the Soviet Union became independent in the year 1991 and since then is a democratic Presidential Republic. Bishkek, formerly called Frunze, is the capital with about 1 million inhabitants, the country as a whole has about 5 million inhabitants and an area of 198,500 km². 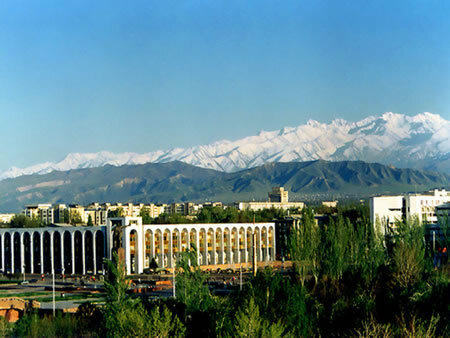 Bishkek, the capital of the Republic of Kyrgyzstan, with a population of about 1 million, is situated in the north part of the country (Chui-Region). Especially the centre is heavily influenced by the Soviets, and you can enjoy quite a number of typical soviet-style architecture (Philharmonia – concert hall, government building, Historic Museum, Monument for the Great War of the Native Country) but also modern monuments pointing out the traditional Kyrgyz culture (Monument of Manas, Monument of Independence, as well as many statues of Akyns, Manas’chi and local governors of different periods). Issyk Kul is Kyrgyzstan's largest lake and at about 180 km long by 70 km wide and 668 meters deep at the deepest point (the average depth is about 300 meters), it is the world's second largest mountain lake – and the fifth deepest lake in the world. The lake has been held in high regard by the Kyrgyz – it is known as the “pearl of the Tien Shan” – and in 2004, the government declared the lake as the “property of the nation”. One source even suggests that, at one time, it was even forbidden to swim in the lake. At the highest altitudes, snow falls and does not melt. As more snow falls, it compresses that which is already lying on the ground, and forms sheets of ice. Some of the ice is forced down mountain valleys forming valley glaciers gouging a course (typified in U-shaped valleys and hanging streams, which are left over once the ice retreats), and carrying debris (moraine) along its course to deposit it some great distance away. The ice in valley glaciers (known locally as “ice rivers”), can move at a rate between 3 and 40 cm a day, depending upon the size – width, thickness and slope of the valley. At the edges are often found crevasses – which may easily be covered by freshly fallen snow, and so present a particular hazard to mountaineers. Glaciers (8,000 of them – one source says 8,208), and permanent snow cover some 8,100 square kilometers - about 30% of the total land area of the Kyrgyz Republic. The glaciers themselves cover about 4% of the surface area of the country. The most famous is the Enilchek Glacier – actually there are two branches – Northern and Southern in the Peak Pobeda (7,439 m)/Khan Tengri (6,995 m) massif in the Eastern Tien Shan. Some glaciers are within easy reach of Bishkek, (for example the Ak-Sai (3,500 m) and Adygene (3,200 m) in Ala Archa National park), and several companies offer two or three day treks to them. Together, the glaciers contain some 580 billion cubic meters of water - enough to cover the whole of Kyrgyzstan to a depth of 3m. Diversity of flora in Kyrgyzstan is determined by the altitudinal zoning. Slopes, varying by humidity, create different kinds of vegetation. On northern slopes steppes, meadow-steppes, meadows, bushes and forests are wide spread. On southern slopes, because of dry climate there are no zones of forests and alpine meadows; semi-deserts and deserts prevail here. Flora of Kyrgyzstan numbers more than 3,676 plants of lower species and 3,786 plants of higher species. 600 types of useful wild growing flora are found in the territory of the Republic, among them 200 types of officinal plants are found: vasilistnik, Karakol akonit, big elecampane, Turkestan motherwort, Turkestan termopsis, St John’s wort, coltsfoot, origanum, sea buckthorn, horse-tail ephedra, Veratrum lobelianum Bernh. etc. Wild plants having an economic importance include tinning joinweed, saltwort, barberries, rhubarb, Leafless Echinochloa, ferulage types, Fergana spurge, golden drop, types of thyme etc. A unique natural formation in the south of Kyrgyzstan is the walnut forests. Walnut, Siverse apple tree, Sogdy alycha, standard pear, Korjinsky pear, Tian-Shan cherry, barberries, almonds, pistachio, Djungar and Turkestan hawthorn and many others are growing here and represent a valuable genetic material. 101 types of protozoa, 10,242 insects and other arthropods represent fauna of Kyrgyzstan. There are more than 1,500 other invertebrates, 75 fish species, 4 amphibious, 33 reptiles, 368 birds and 83 mammals. At an altitude of 3,400-3,800m grey marmots, silvery and narrow-skull field vole are particularly distinguished. The Brown bear can be found in the alpine meadows in the summer time. A lot of wild rams, marmots, hares, and mountain goats are concentrated in the Alpine meadows as well. Wolfs can be found here also. At the altitude of 3,800-4,000m there are no mammals as permanent inhabitants but sometimes the grey marmot or narrow skull and silvery field voles can be found. Higher than the snow line, at the rock juts (up to the height of 4.4 km) some types of birds make nests: red belly redstart and alpine mountain finch. There are a lot of other birds: mountain goose, rock pigeon, partridge, Alpine jackdaw, and big desert bullfinch. Mountain goats can be found at the height of approximately 4,500m, along with beasts of prey – snow leopard. The rarest species of animals such as wild ram, aurochs, wild mountain goat, roe, red deer, bear, deer, lynx, and snow leopard are included into the Red Book. To help preserve the priceless, pristine, virgin, natural resources that it possesses, Kyrgyzstan has a total of 83 specially protected natural territories, with a total area of 761,300 hectares, which is almost 4% of Kyrgyzstan’s total land area. Perhaps, the most famous of these specially protected regions is Ala Archa – just outside Bishkek. One of the main tasks of the National Parks is to organize tourism that is not harmful to the nature. As a result of its varied and turbulent history, the country throughout the centuries became a real melting pot of nationalities: The ethnic group of the Kyrgyz, traditionally nomads that still nowadays often live as half-nomads (see also "Kyrgyz people and their traditions"), makes up only a bit more than 50% of the population. The two other important ethnic groups are Russians and Uzbeks, both with about 15% of the population. The Russians came into the region during the 19th century, and especially the capital Bishkek, only 125 years old, is heavily influenced by the Russian way of life and Soviet architecture. Because of this people, also the second-biggest religious group in the mostly Muslim country (80%) are Russian-Orthodox. The Uzbek people lives to its biggest part in the south of the country, close to the border to Uzbekistan. This part of the country is also much more influenced by Muslim traditions than the rest. Other people out of those more than 80 nationalities and ethnic groups living in Kyrgyzstan are European ones like Germans or Ukrainians, Muslim Chinese people like Dungans and Uighurs, as well as Tatars. Although there are so many different people living in the region, whose lifestyle and traditions sometimes differ a lot, they all have one thing in common: The typical Central Asian hospitality, that can in no way be compared with the way guests are greeted in the western world: Never you will come across a yurt without being invited for a cup of the national drink Kymyz and a snack, never you will be invited into the house of locals without facing a table, completely full of delicacies already before the main dish is served. Nonetheless, gastronomy is only one way where hospitality is shown: The warmth and openness of the people can be felt already when you first get acquainted, and at the second meeting you're very often already considered as a family member!